Posted on February 11, 2019 February 11, 2019 , in Above Ground Pools. 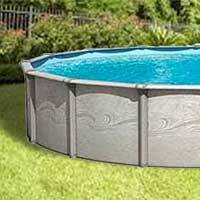 Most above ground swimming pools are available in only a few different heights. These will normally run from a low of about 42 inches to a maximum of about 54 inches. However, just because you have a 54-inch pool doesn’t mean that your water will be four and a half feet deep. You have to remember that the swimming pool’s skimmer and the level of the water will need to be below the edges of the pool. So, a 54-inch high wall will likely mean your pool is just above 4 feet deep. This is when people start asking, “Can above ground pools have a deep end?” or conversely, “Can above ground pools have a shallow end?” or even, “Can above ground pools have different depths?” Well, the fact is they can have all of these, but there are some things to keep in mind. To get a pool with different depths, round pools are much easier to work with. Round pools tend to not have straps or braces that run underneath the structure thus allowing you to dig a little deeper in the centre of the base and create an area of greater depth. Oval pools typically have braces or straps that run underneath and attach opposite walls of the pool to create stability. These straps get in the way of being able to create a deeper or shallower end of the pool. There are oval shaped above ground pools that work without the braces, but they tend to cost much more than the regularly braced types. Swimming pool liners are built to be flexible, but there is a limit. If you have a regular pool liner, it’ll be able to extend to a depth of an extra 10 inches or so, but any further and you’d need to install an expandable liner – which, of course, will cost you more money. Expandable liners will allow you to go an extra foot deeper than allowable by a regular liner. One thing to keep in mind, however, is the diameter of your pool. If your pool is quite small you won’t have much room to include a deep end and you may end up with a gradient between the shallow and deep end that’s uncomfortably steep. It may make it dangerous for young kids or make it impossible for your automatic pool cleaner to climb out of the deep end. Also, the deeper you go, the more likely the bottom of your pool liner will end up be wrinkled. Although it’s not the end of the world, it’s kind of uncomfortable underfoot and the wrinkles will become natural deposit areas for dirt and debris making the pool harder to keep clean. To find out more about our above ground pools, download a brochure.